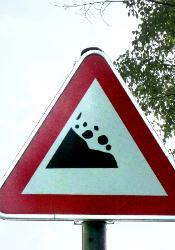 Belgium doesn't count much natural habitat where rock signs can live. I therefore didn't expect many finds. But team members (thoroughbreds as they are) were able to bring an impressive collection back home. 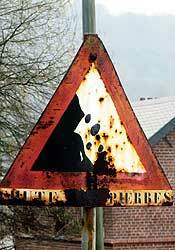 Road-signs often unwillingly expose something about the inner workings of a country. 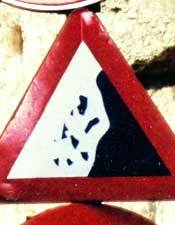 The rock-sign department should have told the bus-stop people about the risk of pebbles landing on people's heads. The bus-stop reveals that both departments work isolated without any exchange of information, or at least without listening to each other. 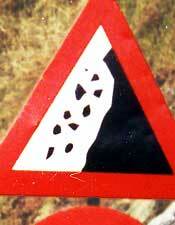 Belgian Falling Rocks show a wide variety in the number of boulders, in their shape and in the general configuration. 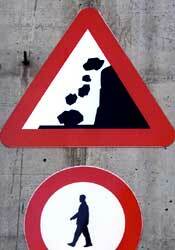 Though they try to look like a menace, this often fails because of the unrealistic composition: the rocks often don't look natural and they are falling too far away from the wall (also seen in Iceland). 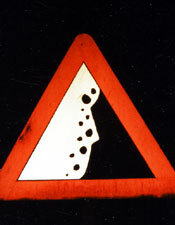 Rock signs featuring less than three boulders really are rareties. 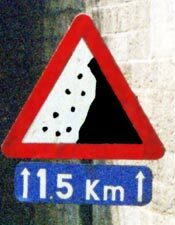 It took us 9 years to find a second Falling Rock sign with two boulders and another 3 for the next one (see Jordan and Great Britain). 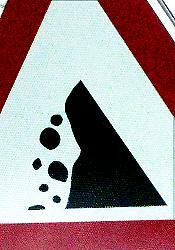 Although the U.S. of A. has a textual warning sign saying Falling Rock a graphic design with one rock only is currently not known. 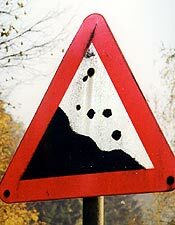 A German sign in the heart of the country! Let's hope it doesn't spread. 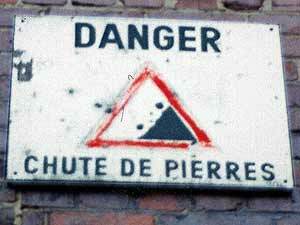 As Belgium already has a road worker from the Netherlands, we should only wait for a French children's sign and then parcel out the goods. 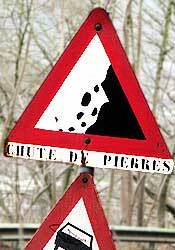 Chute de pierres or 'falling rocks'. 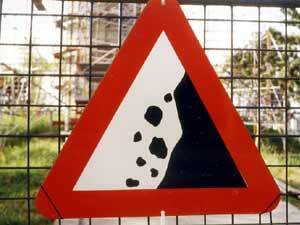 Surprisingly often Falling Rock Signs are mounted in a wrong way. 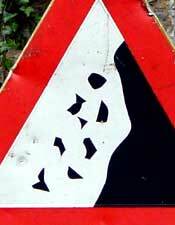 It never happens to Children's crossings or Men at Work. 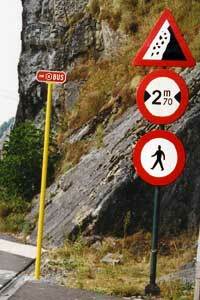 We have similar examples from several other countries like South-Africa, Iran and Armenia (where we try to understand the challenges faced by the road worker who is supplied with the wrong sign).